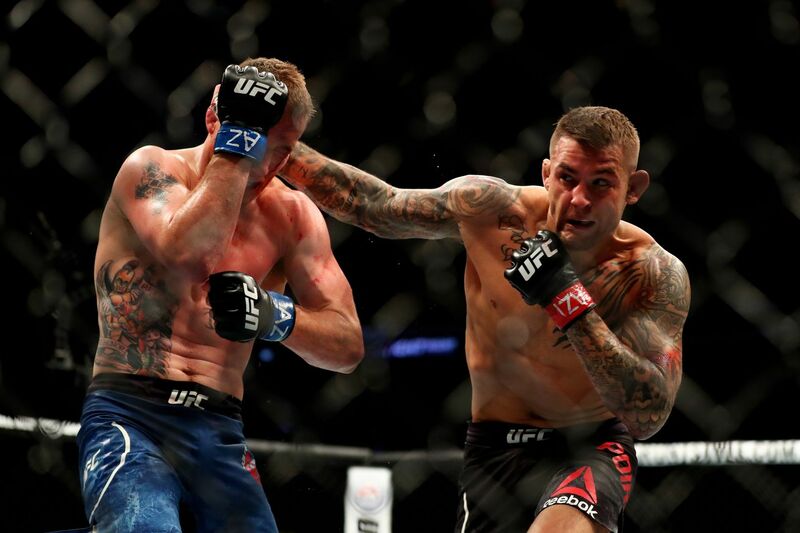 Dustin Poirier had to push through an unfathomable amount of leg damage earlier tonight (Sat., April 14, 2018) at UFC on FOX 29 from inside Gila River Arena in Glendale, Arizona, but he was able to stave off the always ferocious Justin Gaethje to capture a fourth-round TKO finish. This was really one of the best fights you’re ever going to see, which is the norm whenever Gaethje steps foot inside of the cage. Poirier was able to land heavy head shots at will over the course of the first three rounds, but “Highlight” returned favor with punishing leg kicks that really hampered the movement of “Diamond.” Poirier hung in tough, both fighters pushed through inadvertent eye pokes, and combined to deliver a potential Fight of the Year performance. While it may have seemed like Poirier was fading entering the fourth round he caught Gaethje with a crushing left hand. Gaethje was put on skates, danced around the cage with little response, and Poirier eventually found the TKO finish along the cage. With this performance, Poirier walks away with the biggest performance of his UFC career, pushing his current divisional record to 7-1, 1 NC. “Diamond” looks better than ever and may deserve a shot at Khabib Nurmagomedov’s lightweight title after powering through an inhuman contender like Gaethje. If a title shot isn’t in the cards for Poirier, maybe a rematch with Eddie Alvarez is. For complete UFC on FOX 29 results and coverage click here.